As Mark Obert-Thorn explains in his Producer’s Note, none of three conductors left behind studio recordings of the works they direct here. In addition, therefore, to the frisson engendered by live concert-giving, only the Haydn has seen limited circulation, and that was for the Japanese Stokowski Society. 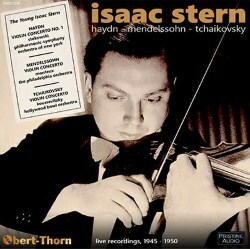 The figure presiding throughout is Isaac Stern. The earliest of the preserved concerts comes from Philadelphia in January 1945, when Stern was 24. Pierre Monteux conducts this CBS broadcast in the city’s Academy of Music which was bereft of an audience because the broadcast took place some time before the evening’s concert. The sound here is a little congested and the soloist takes a few moments to settle down before righting himself only, just as he is about to launch the cadenza, for disaster to strike in the shape of a broken string. Go to seven minutes into the fourth track. It takes a mere 4 seconds for the concertmaster – I assume it was Alexander Hilsberg – to pass his fiddle to Stern and for someone to restring Stern’s. The way Stern starts the cadenza afresh and digs in with such gusto is splendid to hear, after which the slow movement is sensitively phrased and the finale buoyant and exciting, though the recording renders the percussion tinny. In December 1949 in a Carnegie Hall clearly witnessing the return of Spanish Influenza, Stern battled the bronchial denizens in Haydn’s Concerto in C major. On hand was Stokowski to lead the Philharmonic-Symphony Orchestra of New York. One doesn’t associate Stokowski much with Haydn but as I mentioned years ago in the context of a brief review of a Cala disc his recording of Symphony No.53, the Imperial, with the band known as his Symphony Orchestra, was very recommendable and still a delight to hear today. He proves a sympathetic collaborator throughout. Stern had recorded the work commercially two years earlier, self-directing the accompanying orchestra, and is just as fine here – authoritative, masculine but not overbearing with no frills or bogus expression in the Adagio which is spun songfully over the restless audience who at least reward him with applause. The finale is alert and athletic. One interesting feature is the presence of Stern’s accompanist Alexander Zakin, who plays the very audible harpsichord continuo and who also wrote the cadenzas. It’s only a shame the recording is rather flat and lacking in spatial separation. The finally there is the 1950 Tchaikovsky with Koussevitzky conducting the Hollywood Bowl Orchestra in August 1950 which sports easily the best sound of the trio of concertos. Stern has the discretion and probity to open with sustained lyricism and unhurried expression, before Koussevitzky ushers him onwards. With a finely dispatched cadenza, judicious dynamic variance, and the unmistakable sound of Stern’s slides – he largely abjured these in music from the Classical and Baroque periods – this is a splendid realisation of the concerto, which ensures a pesante quality in the finale as well. Stern recorded all these works commercially, sometimes multiply, but none of the selected conductors did. In any case there seems to be real rarity value to the Mendelssohn and Tchaikovsky which, as mentioned before, don’t seem ever to have released before. All the more reason, therefore, for Stern collectors, in particular, to lend an eager ear.